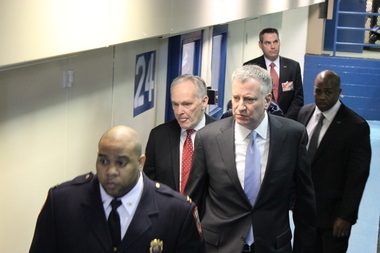 Mayor Bill de Blasio and Correction Commisioner Joseph Ponte toured a new enhanced supervision unit at Rikers Island in March. EAST ELMHURST — Lawyers for a group of former Rikers inmates won a package of “historic” reforms for the city’s jails in a settlement, the city said Monday. The package of reforms includes federal oversight of violence at Rikers Island, a new use-of-force policy that limits when officers can use physical violence to subdue jail inmates, and expanded video surveillance to monitor corrections officers’ behavior. “This agreement is historic in scope, putting in place landmark reforms that the parties all believe will make the city jails dramatically safer,” Mary Lynne Werlwas, a Legal Aid lawyer who helped spearhead the 2012 case, said in a statement. The class-action case that brought the now widely acknowledged “culture of violence” at Rikers to light involves Mark Nunez, one of a group of inmates who was assaulted by jail staff without provocation. Nunez was brutally attacked — maced, beaten by officers in riot gear, stripped naked and taunted — all because a correction officer was upset that other workers had left food in a pantry fridge overnight, according to court documents. New York’s federal prosecutor Preet Bharara joined the class action in 2014. “Today’s agreement represents another strong step toward our goal of reversing the decades of abuse on Rikers and building a culture of safety for officers and inmates alike," de Blasio said in a statement. The reform package also includes new anonymous reporting protocols for use of force incidents and experimental measures like body cameras for officers, according to a letter from Bharara. “We look forward to implementing all elements of the agreement, and pledge to work closely with the federal monitor as we further establish a culture of safety at DOC,” corrections commissioner Joe Ponte said in a statement. Werlwas said she is confident the policy changes will make a difference in the violence that has plagued Rikers for years. “For too long, New York City prisoners have suffered dreadful injuries at the hands of staff — fractured facial bones, traumatic brain injuries, internal bleeding — from excessive and sometimes brutal force,” Werlwas said.